By Mike Collins, Michael Dean, Brian Dedora, Janine Mathee, Steve McCaffery, bpNichol and John Riddell. Together with papers undelivered at Un Fair not held in Toronto, Canada January 28th, 1984. To which is appended A Correspondence relating to UN FAIR & L’AFFAIRE ”PATAPHYSIQUE. Toronto: grOnk Final Series #5 (March 1985). 134 pages, printed in an edition of 100 copies. Colophon: "Distributed in the great / now-you-see-it-now-you-don't / tradition by / grOnk"
A Correspondence relating to UN FAIR & L’AFFAIRE ”PATAPHYSIQUE. 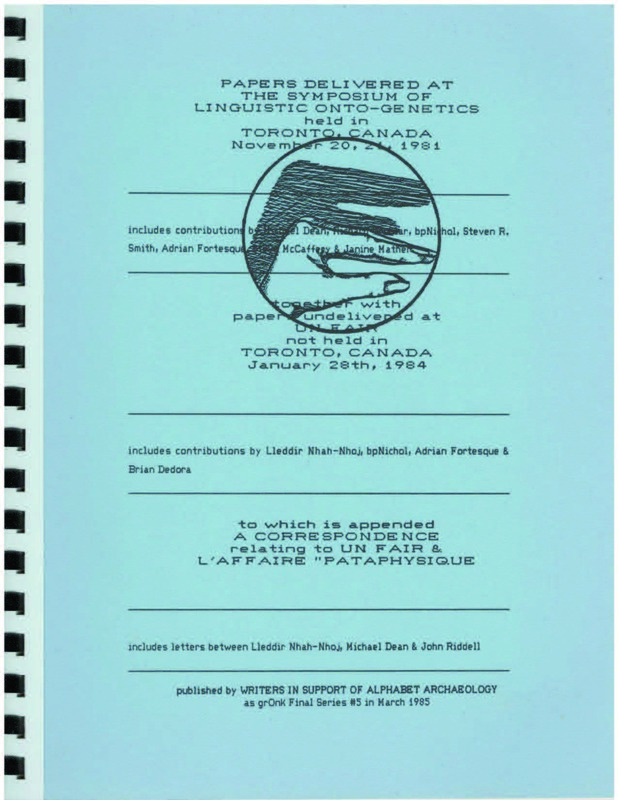 Letters between Lleddir Nhah-Nhoj, Michael Dean, and John Riddell.